A series of dihydroflavonol derivatives (4a–4l) were synthesized from chalcones via classical Algar–Flynn–Oyamada (AFO) reaction and characterized on the basis of spectroscopic analyses. 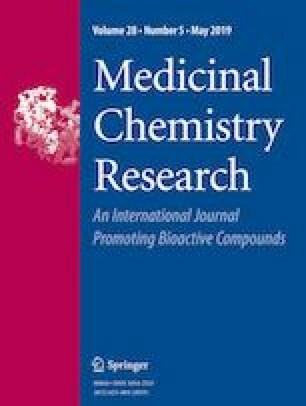 All synthesized compounds were evaluated for their inhibitory activity against the pro-inflammatory-inducible TNF-alpha, IL-1beta, and IL-6 in lipopolysaccharide (LPS)-stimulated RAW 264.7 cell lines and showed various efficiency. Furthermore, compounds 4d and 4k were selected to examine their in vivo anti-inflammatory activity by using two classical models. Herein compound 4k showed maximum anti-inflammatory activity of 32.98% inhibition in mice ear-swelling model and 40.06% inhibition at the 2 h intervals in rat paw edema model in comparison to the two references: aspirin and meloxicam. Similar effect was observed at a lower dose. In addition, the compound 4k was docked against cyclooxygenases-2 to validate the attained pharmacological data and provide understandable evidence for the observed anti-inflammatory activity. The authors would like to extend their sincere appreciation to the National Natural Science Foundation of China for funding this research group (No. 31370378).